When he starts moving he starts to shine: with an actively working hindquarter this dressage stallion knows how to please in all three basic gaits. 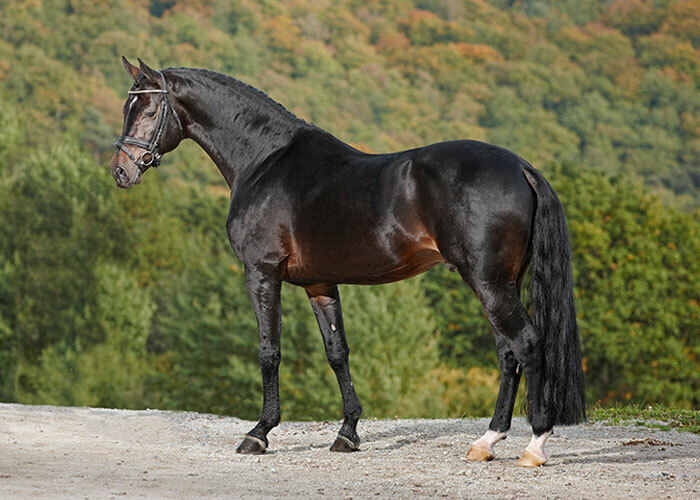 Combining two of the most successful, modern dressage lines in a beautiful package, Fuerst Belissaro is a stallion who is always motivated and moves with elasticity. His active hind leg, freedom through the shoulder in trot, the perfect walk, and uphill canter won everybody over at his licensing, and he received a 9.0 for character and good scores at his 70-Day stallion performance test taken at the young age of three. 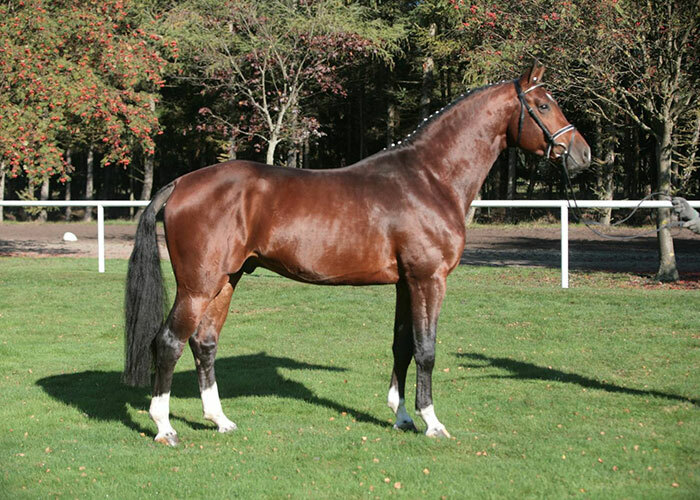 From his first offspring, Fuerstenball produced the champion stallion, Follow Me, who became the price highlight (400,000 Euros) at the Oldenburg Stallion Days 2012 in Vechta. In Verden in 2013, Fürstenball presented four licensed stallions, including Fuerst Belissaro and the price highlight Farrell (€ 460,000, Blue Hors Stud). Ten sons have been licensed so far. For years he has produced top foals, which have been sold many times in the six-figure price bracket at German auction sites. 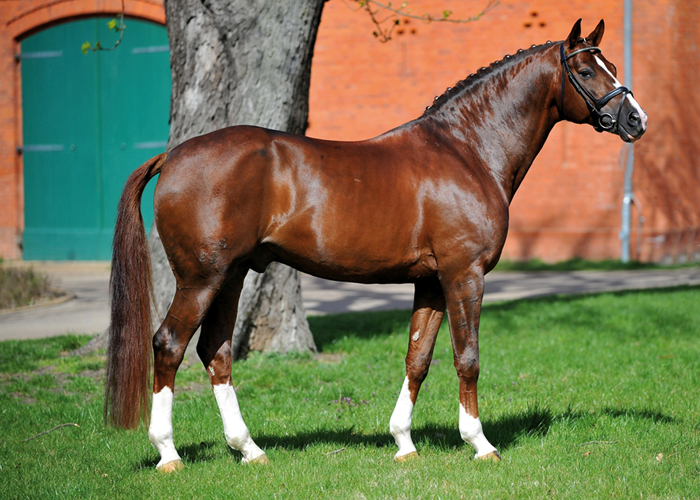 His first offspring won young horses competitions in 2014 and have brought their father with 170 points to be amongst the top 1% of the FN’s breeding value index list.The offpring of Fuerst Belissaro’s dam sire, Belissimo M, have also set records: Nine stallion performance test winners and three reserve performance test winners from the first few crops is probably a world record! In addition, there are five Bundeschampions and, with Blickpunkt, there is a double bronze medal winner of the World Championships for young dressage horses in Verden. Belissimo M has produced more championship winners, and many highly priced auction horses such as his daughter, Belandra, who sold for 572,000 Euro to Denmark at the PSI Auction in Ankum. All are the result of Belissimo M’s resounding inheritance of riding quality. 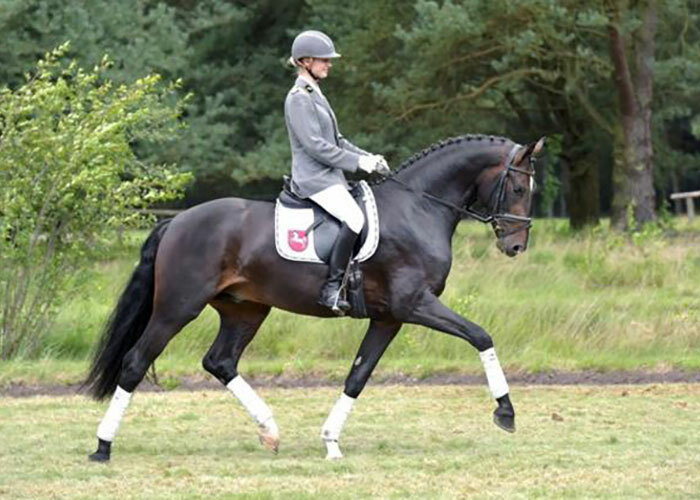 Fuerst Belissaro: dressage breeding stamped with top performance genes.